" ... to read through this trove of tributes is also to observe the rise of an historically scattered, poorly understood, archipelago of health and healing traditions that has become - against all odds - a prodigious headland of integrative health, now increasingly rooted to the mainland of American health care." Thank you, each of you whose email addresses were covertly dug out of my Outlook directory so you could be asked to contribute to the Lifetime Achievement Living Tribute book that was presented at the banquet night of the International Research Congress for Complementary and Integrative Medicine (IRCIMH) on May 15, in Miami. I am a wealthy man! All of us at IRCIMH had been told an award was coming to someone. I was utterly astonished when my name was called. Someone commented that my failing to penetrate a secret closely held by over 150 human beings had seriously harmed any credibility I might ever have had as a journalist. That said, the day the gift arrived was already wildly emotional. The reflections on 30 years compounded the craziness. Here is a very personal account of my receipt of the award and what it is meaning to me. It occurred to me when I sat to push the news of the book out to you that a good way to return the honor might be to share very personal aspects of the moment in which I received the award. The day was an awful roller-coaster. In the moment I was called to receive the honor I was two weeks into a growing and increasingly overwhelming fear that I was living with a re-occurrence of my 2008-2009 cancer of the tonsil. I was haunted and certain. What else could that familiar tickle be? In 10 hours, at 5:00 AM the morning after the IRCIMH gala, I would be rising from bed to drive north to Jupiter, Florida. A practitioner friend experienced in integrative oncology, Frank Ervolino, ND, LAc, had set up a throat scope check up with an ENT/cancer colleague associated with Jupiter Medical Center. Amidst pending doom and startling tribute, the next day I received a "clean" diagnosis. By 9:30 I was seated in a car in an empty lot by a windswept Florida beach with my spouse by my side reading sections aloud and sharing alternating waves of gratitude, laughter and tears of great relief. It's nice to learn one's exit is not likely in the near future. The setting: how would a research community respond to salsa music? The lead planner of IRCIMH is Georgetown University educator, researcher and impresario Adi Haramati, PhD. Adi also guided the event's predecessors in 2006, 2009, and 2012 in which I'd had roles in marketing and report-writing. When he asked if I'd join him at the head table for the Thursday night, first ever IRCIMH banquet, I readily accepted. 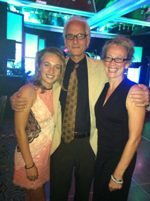 We'd talked multiple times about his idea for IRCIMH 2014 to add to the inestimable value these scientific conferences have had in advancing the field a new dimension: the community building ritual of banquet and dancing. Salsa and researchers. Salsa and data-brains. Quant wonks and Latin rhythm. How would these mix? IF dancing began, would there be more reductive scientists or real world research folks cutting it up on the dance floor? Adi had announced earlier in the day that there would be a special award presented at the banquet. As a news guy, I was interested. Integrator fodder. I couldn't recall any such award before. On my way in, I asked Ather Ali, ND, MPH, the Yale rep to CAHCIM's steering committee, to tell me who was getting the award. He shrugged: "I'm not telling." Playing by the rules. Then I saw Joe Pizzorno, ND, who had hired me into my first job in this field, in 1983. This was at the then 5-year-old John Bastyr College of Naturopathic Medicine, now Bastyr University. Joe wasn't a regular IRCIMH attendee. I asked why he was there. He said something about a feature for the publication for which he is editor, Integrative Medicine: A Clinician's Journal, on organizations making a difference in integrative health and medicine. He must have enjoyed how I, responding to his alibi, figuratively grabbed him by the lapel and pitched for the track record of the organization, ACCAHC, with which I work. I like dancing. But I wasn't in the mood for salsa or the banquet or for the Miami conference itself. Many of you will recall, since I shared my process with Integrator readers via Caring Bridge, that I had been diagnosed with cancer of the tonsil in late 2008. I'd been clear since April 2009 gracias a las diosas, the radiation that burned it off, the chemo that mopped it up, and the score of complementary mind and body therapies that helped me heal. Those who have had cancer will know how the niggly sense that the cancer has returned can be a worse I'm baaack than Schwarzenegger in The Terminator or Nicholson in The Shining - whoever it was said it first. The tiny sensations haunt by their familiarity. Pulse of a tiny dark heart. Emissions of barely perceptible undoing. I'd not had a scare since 2010. I'd not yet shared this one with my spouse, Jeana Kimball (an ND, LM, MPH) because of a major family gathering coming up in two weeks for our daughter Roz's graduation. Why bother her with my uncertainty and concern? Maybe it'll just go away. I'd shared the now festering fear for the first time with another human being 3 days before, the Monday I arrived in Miami. I'd a walk planned with a friend, Patricia Herman, ND, PhD. We weren't 50 meters out the door when I blurted it out. "Oh," she said, "you need to get that checked right away. And you need to tell Jeana right away too." She knows Jeana: "She's going to be angry if you don't." I called Jeana within the hour then got the ball rolling with Frank for the Friday morning scoping appointment. Thank you Patricia and Frank. So there I was, at the head table that Thursday night, ensconced between Adi and a friend since 1998 Adam Perlman, MD, MPH, the Duke IM leader who was the Consortium's past president. I was drinking water rather than wine. Don't feed the cancer. I was certain the next morning's news would be bad. Would we need to move back to Seattle from Rincon for care? What treatment would work? The radiation option was exhausted. How would we pay? Our international insurance has a cancer exclusion. I pictured my death within months or a couple of years. Should I give Jeana a list of who I wanted to pay tribute to me at my Memorial or, as my Mother chose, let the living decide? Fear was winning the mind-body battle. Macabre, dark, and familiar. My psyche had headed south. That's when Adi went forward and introduced the award. My name came though this fog. As it dawned that it was in fact me who was receiving the award, my first thought was that it was a shame that Jeana and our children, Roz and Lucas, would not be there to see. It maybe particularly hard for children to understand what a parent who works from a home office does. Should I pull out my Iphone and start recording? Should I tap on Adam's shoulder and ask him to record it for me? Would that be tacky? Adi called me forward to stand near those who were soon to share their brief verbal tributes. I was, in every sense of the word, neither here nor there - particulate matter spread over a murky time-space continuum. I felt I had two emotional choices: melt down sobbing entirely, or suppress. After my friends spoke (there was a recording and I look forward to hearing them for the first time), I told them and those looking forward to getting to their dinners that the award was perhaps more timely than they knew. I only barely stopped from blurting something, convinced as I was. Adi, conscious of the banquet attendees' culinary interests, was concerned I'd go on at some length. In his Tribute, Rick Liva, ND, RPh suggested that I could "talk the tar off the street, and then some." That was not an issue in that moment. I merely noted that while I had no anticipation of this award, I had imagined something like this. Recognition is lower chakra ju-ju for anyone with a values-centered gig. I noted my great good fortune, as an "integrator" working in many communities, to now after these year have tribes of friends in many disciplines and communities, like those in the Council of Colleges of Acupuncture and Oriental Medicine, with whom I'd been the week before, and here at IRCIMH, that I call home. When I ended my short remarks, someone urged me to look at a table 15 feet away. There sat my spouse, Jeana, and daughter, Roz. They'd flown up from our temporary homed in Rincon, Puerto Rico. Roz bolted up to embrace me, and I to her, and to Jeana. Then, behind them, I saw an even more astonishing sight. There were my three sisters - Pam and Vicki from Seattle and Wendy up from Lima and Ollantaytambo, Peru. Never since 1993 when I started working nationally in the emerging "integrative" movement had any of my siblings had much of a sense of this work or community. There they were, here, in the IRCIMH community, listening to it all. Suddenly, from their midst, an image of my mother, Roberta Roland Weeks - a powerful presence who was not always easy for any of us ("John when are you going back to Stanford to finish the last two quarters and finally graduate ..."), who raised us each to be leaders, who exited this world in 2008. Suddenly an image of her rose, there, perhaps six feet above the table, between my sisters, and was gone as quickly. What a pleasure it was to introduce my colleagues and friends to my sisters, and them to my colleagues and friends! Getting plaqued: "My Dad's a Samurai Data Poet, what's yours?" The tribute was conceived by integrative care consultant (and cancer survivor himself) Glenn Sabin of FON Therapeutics and supported by, I happily note, multiple consortia and other organizations and individuals that cross the integrative health and medicine spectrum. Sponsors included the Consortium of Academic Health Centers for Integrative Medicine (CAHCIM), the Integrative Healthcare Policy Consortium (IHPC), the Academic Consortium for Complementary and Alternative Health Care, FON, the Foundations of Naturopathic Medicine Project, and Integrative Health and Wellness Strategies. 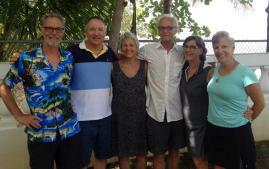 Donors included Sabin, Lucy Gonda, Ruth Westreich, Michele Mittelman, RN, MPH and Lou Sportelli, DC. Team included Adi, Glenn, Taylor Walsh, Pamela Snider,ND, Jade Wood, MA, LMFT, MHSA, Liza Goldblatt, PhD, MPA/HA, and got assistance rifling through Outlook and in other ways from my spouse, Jeana Kimball, ND, MPH. One by one a half dozen of my colleague through the years spoke: Pizzorno, with whom I worked closely from 1983-1993 in setting the foundation for what is now Bastyr University and the naturopathic profession; Adi, a colleague on multiple interprofessional projects since 2000; Liza Goldblatt, PhD, MPA/HA, the former president of the Council of Colleges of Acupuncture and Oriental Medicine and close partner in ACCAHC work, for which she serves as chair, since 2004; Ben Kligler, MD, MPH, a past-chair of CAHCIM, and a collaborator on multiple projects since the National Education Dialogue in 2005; and Pamela Snider, ND, my colleague since 1983, ACCAHC co-founder, and, as she mentioned in her remarks, my "professional spouse." Last but certainly not least was a wonderful video-taped tribute from Josephine Briggs, MD, director of the NIH national Center for Complementary and Alternative Medicine. She referenced my "Opps They Did it Again" open letter with which I welcomed her to her new job running NCCAM. She shared on "open letter to my friend, John Weeks" available here regarding our six years of often quite public dialogue. She closed with a very funny reference to our back-and-forth on the difference between researching the value of "disciplines" and "systems"versus "modalities" and"therapies." The plaque echoed language that Snider used in her tribute. 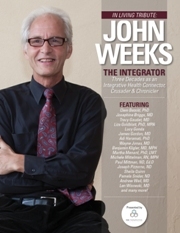 Lifetime Achievement Living Tribute awarded to John Weeks - The Integrator & Samurai Data Poet of the Health Creation Movement: In recognition of three decades as an integrative health leader, connector, crusader & chronicler. Roz picked up on this immediately. She told Snider: "I've always had a hard time saying what my Dad does. Next time I am asked I'll just say: 'He's a Samurai data poet. What's yours?'" The book: would that everyone could have a "living tribute"
Among the more practical of the morbid meanderings of mind that were provoked by the tickle in my throat was whether I'd ask Jeana to have a celebration of my life before I died. I seem to recall that Lee Lipenthal, MD, ABIHM had done this when his esophageal cancer came back and before it ended his life in 2011. Others have done so. On my Facebook site where I posted the book my oldest sister Pam, first-born of the 6 of us, who helped raise me, suggested that more people should have the pleasure of a living tribute. My friend and colleague Jan Schwartz, MA, NBCTM, who has also lived through cancer, agreed. I am a lucky man. When I open the pages and see the photos of the contributors and read your words, I feel like Scrooge McDuck running his greedy hands through his mounds of coins. These 150 perspectives on my life include one from each of those mentioned above plus Tracy Gaudet, MD, Michael Cronin, ND, Mary Jo Kreitzer, RN, PhD, Bill Meeker, DC, Diana Thompson, LMP, Tabatha Parker, ND, Ken Pelletier, PhD, MD (hc), David O'Bryon, JD, Barbie Dossey, RN, PhD, Larry Dossey, MD, Clem Bezold, PhD, Vic Sierpina, MD and many, many more. Whew. 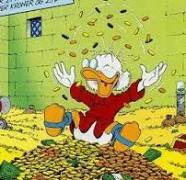 Did I say I'm a rich man? The reading, however, initially put me into a phase of junior high-like self consciousness: I was just behaving like that person said, wasn't I? Larry Dossey's book, One Mind, which he'd gifted me at IRCIMH, is feeling just the right reading, post award. A kind of internal integration settling in: "A good citizen of the United States"
The tumor is nowhere to be found and the award is in. But where is that $100,000 Bravewell check to help the organization with which I work to make ends meet in carrying on the work? (Jeana, reviewing this re-posting, suggested I include this also from Liva's tribute: "Not afraid to ask for money to support him and his cause." Perhaps the biggest pay-off to me personally was the feeling of my natal family and work life somehow integrated for the first time. When I'd left my Bastyr/ND era (1983-1993) and took my work national 20 years before, I had resigned myself to not being seen for what I do by many of my closest people. The presence at the IRCIMH gala of my sisters, my spouse and daughter, and knowing my two brothers, Bob and Tom, and son Lucas would have come if possible - this somehow knit together these separate worlds of profession and family. In the midst of this family re-union, I began thinking of my last exchanges with my father, Benjamin Ervin Weeks, dead now since 1987. My choices to be involved in this work, which began just 4 years before he died, were better understood by his wide view of life than by my more patriarchal mother. He told me in our last lunch that while he respected what I was doing at Bastyr that he had a feeling I would be involved in something beyond it. He was a believer in the best hope and opportunity that the U.S. ever represented for people. While at his bedside the afternoon he died, tanked up on morphine to ease the howling of his lung and liver cancer, he said his last words to me. Just barely audible, halting, he said you're a ... good citizen ... of the ... United States. To receive this tribute is many things. One of these is to feel I've honored what he saw in me, and the charge he gave me. The booklet can be downloaded here. A limited number of hard copies are available by sending $5 for postage and handling via the ACCAHC PayPal account at www.accahc.org or by sending $5 to ACCAHC, 3345 59th Avenue SW, Seattle, WA 98116.